An interim design, the MC80b was an improvement over the original MC80. The MC80b had a much more heaviy reinforced hull, and featured multiple backup shield generators. Built for durability, these ships were able to withstand heavy damage while blasting through the more limited shielding of Imperial ships. Ships in this line were refitted to hold up to eight fighter squadrons, a deadly array of firepower when considering the Rebel Alliance's fighter superiority. 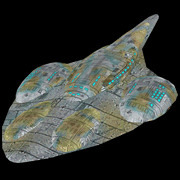 Like the MC80, and unlike the MC90 Star Cruisers that would come nearly four years later, the MC80b was not designed to accommodate different species. Holographic displays and monitors were optimized for Mon Calamari vision, and some controls required movements that were nearly impossible for humans to perform.